Social media in particular, appear to have taken – intentionally or not – a fundamental role in the awakening of citizens, especially the young ones that are keen internet users. Posting a statement on our personal Facebook page or updating our tweets has been gradually integrated to our everyday lives, at a level that we can no longer easily recall our previous ways of self-expression. To what extent, though, is it normal to adjust our life moments to a social platform that will afterwards do the hard job to securely mediate our ideas, anguishes or feelings to our internet companions? Is that kind of semi-protected exposure – as we don’t confront face to face any possible contradictions or disapprovals – a step forward to human communication, and even more, could that have real effects on the re-politicization of citizens? When I first joined Facebook, back in 2007, no one really could imagine how this communicative tool could work. It was just funny to find your past acquaintances, take a look at their personal information and photos sometimes without them even knowing it and feed our need of curiosity about how their lives are progressing. Real, pure, on real time information has escaped the strict limits of professional journalism and has now passed into the hands of ordinary citizens, who testify the events they experience, thus leaving no room for any kind of misrepresentation or falsification, by the government oriented Media organizations. On the other hand, there is a lot of skepticism towards social media and their possible political effects that are according to them, more or less a form of a ‘couch-potato democracy’. In particular, its critics are describing these alternative kinds of political engagement as an easy and low-cost method to virtually participate in a protest, without actually contributing to social or political change - ‘‘committed actors cannot click their way to a better world ’’. (Shirky,C., 2011 p 9). Though, a possible answer here could be that social media’s effectiveness doesn’t derive from a kind of an exclusive ability to change the world, but on the contrary, from their contribution to a new system of coordinated social movements that aim to totally utilize the benefits of digital, information society. But still, to what extent could we rely on social media for the development of our social presence in the world, and after all, is it really a progress to participate and contribute to both interpersonal and social actions, securely hidden behind our laptop or cell phone? The voices against the level of social media’s penetration have strengthened, somehow doubting the maintenance of human integrity through these processes. As Prof. Anis Bajrektarevic characteristically puts it, ‘’Human integrity is self-molested (brutalized) and self-reduced (trivialized) to a lame shop-window commodity, which is purchasable 24/7 by ‘poking’ on the photo of someone’s personal profile. And, likies are available to give a rating for ‘displayed commodities’. (Bajrektarevic, A. 2011). Additionally, when it comes to politics, part of the scientific community underlines the necessity to perceive social networks only as supportive tools to more fundamental freedoms (public speech, free press, interpersonal communication, free and fair elections etc.) and not as a panacea to every socio-political uprise. After all, seen from a historical point of view, media have always played a fundamental role in social change but other more determinant factors led the road to change. According to German philosopher Jurgen Habermas, the printing press helped in Europe’s democratization process by providing free space for discussion and political interaction among citizens (in Shirky, C. 2011, p 6) . However, the main aim of this article is to present and discuss the findings of a short survey, which tried to examine how Greek internet and social media users, perceive social networks, how exactly do they utilize them and even question the level of engagement of the latter ones with current socio-political affairs. The conduction of this survey (which started on June 10th and was finalized on June 29th 2014) was based on the method of Simple Random Sampling, which is the most widely-used probability sampling method and was considered as the most suitable one for the limited audience of 100 respondents, as it was both easy to implement and analyze. After the target group was clearly specified, all possible respondents were equally likely to participate. The link to this online survey – written in Greek as it was specifically addressed to Greek citizens, indigenous or expatriates – was repeatedly posted on my personal accounts on Facebook, Twitter, LinkedIn, My space, on different social groups of Universities of Political Science/Communication/International Studies, students’ fora of University Departments (MBA Program – Athens Open University, Department of Social Work -Technological Institute of Crete), Associations of Young Scientists (i.e. Scientific Association of Young Political Scientists - EONEPE) and other research groups, profile pages of online journals (Apopseis.gr, Politicsonline.gr) etc. and was also sent via e-mail to all my corresponding contacts. In this short survey, we have focused on the age category of 18-35 years old (even though we have very few responses that exceed this age limit). The reason why we have selected this particular target group is that it represents a number of citizens that are both politically active and digitally literate at a significant level, compared to citizens of other age groups. According to Eurostat (2009), in 2008, more than 70 % of those aged 16–24 used a computer daily and 66 % used the internet every day or almost every day, mostly from home and from the place of education. Especially young generations (aged 16–24) have integrated the Internet into their day-to-day life as a communication tool, e.g. using search engines to find information (86 %), sending emails with attached files (77 %) or posting messages on chat rooms (61 %) (European Commission, Youth in Europe, 2009). - Political and social activity. - Deep diffusion of new technology and digital means of communication. Although, we have chosen to include the citizens of between 25-35 years old as well, as they are, in most cases, more politically mature with the comparative advantage of multiple, previous voting experiences as well as of a consequent greater engagement with politics in general. One of the first questions aimed to investigate which are the most popular social networks between Greek internet users. Facebook is a great winner, gathering a 42% of the total of responses. When did you start joining these (or one of these) social networks for the first time? 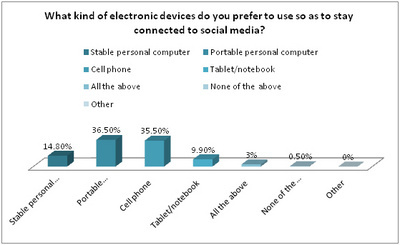 An interesting, though predictable finding is that the majority of users prefer portable devices to stay connected on social networks (cell phones, laptops etc.). The level of penetration of social media in people’s everyday lives is more than profound, as they feel the necessity to embed this usage in every particular aspect of their day, from a simple comment about the weather or the traffic, to the uploading of photos, usually on real time, from their night out, trip, or any other kind of excursion. Of course, the attraction of numerous likes/retweets etc., is more than essential. Another important issue is the considerable differentiation of users’ attitude towards social media’s character/role when they first joined these networks compared to nowadays. To be more specific, the majority of users, when they first joined social media – between 2007 and 2008 – thought that they had to deal with another platform of indirect, mediated communication, or a free space for entertainment (funny games/applications etc.). Additionally, some of them focused on the opportunity of finding friends and other acquaintances that would probably be connected in the same network, whereas only very few perceived social media as new sites for information on news and events all around the world. Furthermore, there was a minority of respondents who stated that they hadn’t been totally aware of the extent of its/their uses in the first place. On the contrary, today most of the respondents argue that they consider social media as an open environment for information with the capability of interactivity or an open environment for self-expression with multiple possible receivers. 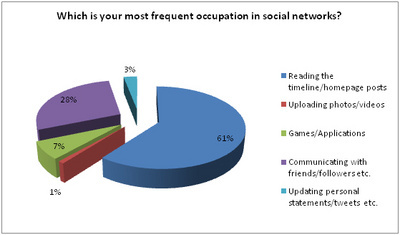 The third most popular answer is that social media are means of frequent, general information. That proves that there has been a gradual transformation on how Greek citizens – internet users perceive social networks. From a typical, communicative use of these platforms they have eventually found a new, alternative field of self-expression, that is though completely different from keeping a personal blog or journal, as in the case of social media, there is the opportunity of numerous receivers in a direct and on real time way, that could even lead to the incitement of new trends, actions and initiatives with unforeseen consequences. (see i.e. the Arab Spring). The distance is somehow eliminated and the citizens feel a new, almost provocative sense of freedom of thought that, for the first time in the digital world, it counts. So, beyond this positive theoretical approach, how do Greek citizens prefer to use social networks? Unfortunately, there is not any coherence between the ways respondents characterize or perceive these networks and the ways they actually use them. A notable idea that seems to be prevailing among the respondents is that they use social media as informative platforms. Reading the timeline, with all their friends/followers updates as well as the groups that they’ve joined (e-journals and news sites, companies’ profiles, institutions’ accounts, celebrities etc.) is obviously the most common use. 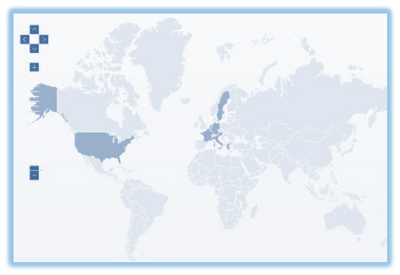 Furthermore, the respondents seem to pay attention on the opportunity to read, upload or reproduce different news or articles concerning less popular topics and interests, that are probably hidden in the chaotic environment of the internet and the anonymity it offers – numerous blogs and sites with articles and news of controversial credibility - . So, instead of individually searching through the internet to find news that have been excluded from the agenda of the predominant means of communication, internet users can now use social platforms as an alternative environment that massively gathers such information. Of course, the danger of exchanging unverified, doubtful information still exists. Only a minor percentage of respondents – around 3.3% - states that their most common use of social media is to write and upload personal statements/tweets or links on their personal page/account. Now when they do write a personal statement, how often do they feel this need for public self-expression and what is it about? Well they are interested in expressing their thoughts and feelings by writing statements in their personal account’s walls or timelines, but only occasionally as only a 13.4% uploads a fresh new statement every day. Most of them choose to post a statement very rarely (35.1%), and the responses that follow record a usage that ranges between one or two times a week and one or two times a month. What about their favourite topics? Comments and uploads just for fun (33.3%), comments on personal moments of their lives or their friends’ lives (28.1%), general comments on current issues or the news agenda (15.6%), comments related to social problems that aim to sensitize others (6.3%), comments related to sports (1%), other topics – unfortunately not specified - (6.3%). So, have Greek internet users chosen a more passive attitude towards social networking? They seem to almost silently participate in everything, giving priority to leisure and fun, hiding their thoughts and ideas behind a like, a share or a retweet but still, they avoid the direct way of self-expression that would of course be exposed to criticism. The irony here is that they do not feel the same reluctance when exposing their personal moments in public (photos, videos etc. ), which probably seems to them more harmless and carefree. When it comes to politics, it appears that there is a considerable hesitation of citizens to recognize a possible political character in social media and even more to have corresponding prospects from their regular use. 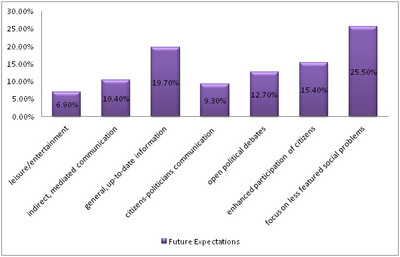 First of all, there is an interesting tie between the two prevalent responses, that are very different to each other, as a percentage of (15.31%) totally disagrees with the idea that social media are a secure environment for open political debates, resulting to a sum of 55.12% of respondents, that have chosen between the first 4 points (1-4) of the scaled responses), actually meaning that the majority vividly disagree with the statement, whereas another 15.31% has selected the option 7, showing that they somehow agree with the statement, even if they have some second thoughts or doubts. Perhaps results would be different if there were just a few, particular responses available (like totally disagree, disagree, agree and totally agree), but now that respondents had to choose from a wider range of responses and were given the opportunity to self-evaluate the degree of their agreement/disagreement, the findings reflect some kind of division among the Greek social networkers. Additionally, most of the respondents don’t believe that these platforms create a new sense of proximity between the citizens and the politicians that use them. Here we have a clear disagreement of 61.22%, with the most popular answers ranging from 1-4 points, expressing total disagreement with the statement. 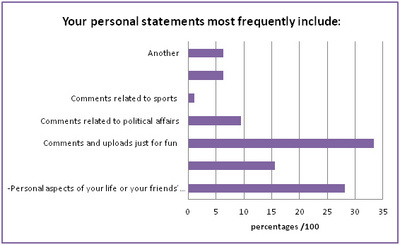 At the same time though, they strongly disagree with the idea that social media are entertainment platforms (the most popular answer is point 1 – standing for complete disagreement with a percentage of 20.41% and the second most popular is point 3, reflecting a strong disagreement for the 12.4% of respondents), and should only considered as such, which is by the way, proportional to the ways the majority of them chooses to use these networks, as outlined above. Moreover, there is an intense fear expressed, that could partly explain this negative attitude, and that is that social media gradually lead to a limitless, uncontrolled exposure of personal political beliefs/orientation etc. (18.37% of respondents chose option 8, considerably agreeing with the statement, and another 14.29% gave 10 points, completely agreeing with this idea.) So here, we are in front of an interesting outcome; people feel free to express themselves on everyday affairs, to make comments or statements, even to participate in short dialogues that criticize the ongoing issues. Sometimes, just a news update on the timeline is more than enough to offer all the necessary incentives to the users, through its reproduction or the placement of a simple commentary. Nevertheless, they are unwilling to step outside these borders and expose themselves to a clear political debate, as they feel that this free space hardly offers a secure and controlled environment for a serious, argument-based, depolarized dialogue between the citizens and the politicians. At the same time though, a great number of respondents strongly accepts the idea that social media provide people with new accessibility opportunities on political affairs and recognize -although very reluctantly- that social networks raise fruitful debates and arguments on major socio-political affairs. 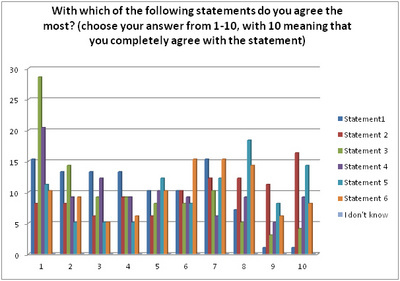 (answers from 7-10 are the most popular between the respondents, with the majority of them showing their highest agreement with the statement – 16.33% voted with 10 points). Statement 5: Social media gradually lead to a limitless, uncontrolled exposure of personal political beliefs/orientation etc. Consequently, they realize the potential of these networks as means of enhancing citizens’ political participation but they don’t feel convinced yet that it is safe or worth getting engaged with these alternative methods. That is also crystal clear in a particular point of the survey: in the question ‘’Do you consider social media as a suitable environment for self-expression or open discussions/debates on major political affairs?’’, 44.4% of the respondents answered probably yes and another said 15.2% surely yes. Only a question below, the same respondents denied that social media are a secure environment for open political debates. (as analyzed above).. So, according to them, social media are suitable for self-expression and open discussions on political affairs but not for an open political debate that is significantly more organized and requires awareness of the ongoing matters, clear political position, active and responsible participation, confrontation with politicians as well as willingness to express opposition if necessary. Another possible reason might be that social media, due to their extremely diverse nature, from funny games and pastime applications to the transfer of important political, socio-economic etc. information, do not seem to have a stable, trustful profile that will predetermine its audience for the necessary accuracy, appropriateness or even seriousness they should involve. Although, all this hesitation illustrated above, does not actually reflect a negative attitude of Greek social networkers towards the future political potential of social media use. On the contrary, the prevalent future expectations underline the importance of focusing on social problems that are traditionally less featured by the predominant mass media institutions (25.5%), as well as the transformation of these networks into reliable, up-to-date, general information (19.70%). In addition to the above, 15.40% of respondents envision a greater participation of citizens on major socio-political affairs via social media, whereas a percentage of 12.70% thinks that social networks use should be expanded to the field of conducting open political debates. Only a 10.4% of respondents has voted for the further enhancement of indirect, mediated communication features (chat, personal messaging, video calls, etc. ) and a minor percentage of 6.9% hopes that social platforms be limited on the fields of leisure/entertainment (games, pictures, applications, videos etc. ). What are your personal future expectations from social media? Greek internet users are highly engaged to social networks, whereas their most frequent occupation is reading the timeline, the posts and the news and in general, keeping themselves informed on both the personal aspects of their friends/followers lives and the current news agenda. 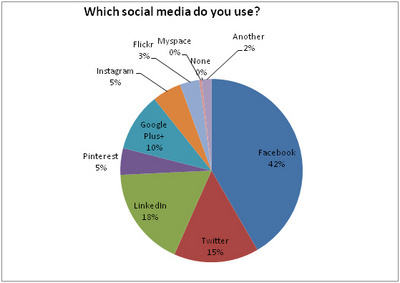 The most popular social networks are Facebook (42%), LinkedIn (18%) and Twitter (15%). The majority of respondents joined at least one social network between 2007 and 2008, a fact that could highly attributed to the great diffusion of Internet usage in Greece, after 2007. The most preferable devices so to stay connected are the portable ones (portable personal computer 36.50%, cell phone (35.50%), revealing an attitude that notably embodies social media presence to physical, everyday social presence. When they first joined social networks, Greek internet users perceived them – more or less – as on-line communicative platforms or chatrooms (36.4%), a useful application to find old friends and acquaintances (19.2%), accompanied with some funny, pastime applications and games (25.3%). There was also a minor percentage of respondents, that hadn’t been totally aware of their actual use (8.1%). Nowadays, they focus on the free access of real-time general information with the added value – compared to other blogs or news sites – of being able to interactively participate, bring issues forward, start a conversation on a hot topic, criticize or express disapproval and await for immediate feedbacks or responses. They like to express their thoughts and feelings but not every day. They update their statements once/twice a week or once/twice a month and even more rarely, and they prefer to talk about their lives or make comments on their friends posts, keeping all this basically to an amusing level. Furthermore, they share, post or re-tweet news on their own or their friends’ timeline and in this way they place their opinion on what is going on in the world, by texting or just ‘like-ing’. If we could somehow illustrate the social image of these networks – at least for the questioned target group – we might present it as a new field of multidimensional interaction, a new alternative opportunity for ordinary citizens to speak for their selves, to be heard, to be followed by a familiar or unknown audience, bring important social problems in the limelight and other less featured aspects of everyday life, the way they feel it and not the way others demonstrate it. They don’t see social media just as entertaining platforms, they recognize the numerous opportunities they offer as tools of enhancing citizens’ awareness and participation but they don’t trust social media as mediated platforms on serious ongoing political affairs i.e. open political debates etc. Greek internet users appear to feel the intriguing power that these networks offer in the political arena, by opening closed doors, by gaining access to a previously strict, top-down approach on the application of political power, as they have the sense that their word could count, if added to a massive, rapid movement of politically active citizens. At the same time though, a great number of respondents questions the reliability and the effectiveness of such methods and is also disappointed with the way Greek politicians have seized this new opportunity of mediatized communication between them and the citizens (more than half of respondents), whereas another 30.6% more optimistically argues that Greek politicians may have a limited presence but they are willing to intensify. In addition to this, most of them also doubt that these networks have created a sense of proximity between them and the politicians. The fear of the unknown as well as the traditionally taboo-subject of openly expressing your political orientation and beliefs could probably explain this hesitation, but only in the first place, as if we’d scratch the surface we could see that all this behavior – conscious or not – has a very strong basis. This means that it is not possible and it is not right to build a brand new, digital world, based on likes and pokes, comments, shares and retweets, we cannot simply text-message a war or peace situation, we mustn’t have emoticons substitute the real expression of our anguishes and feelings. Because of the extreme simplicity of these actions, it is easier to copy a saying, to imitate a behavior, to adopt an action just because it is currently in fashion; it’s posted everywhere, liked by everyone or in other words, because we’ve been brain-washed with it. Literacy is far more important than social media usage and only deep knowledge and personal opinion formulation could change something in the world, accompanied of course by any means available. By no means should we underestimate the incredible power of rapid massive coordination of publics that social media offer as a major step to collective action. On the contrary, we must admit that it’s the level and the frequency of exposure to major social events and current political issues which social media offers to its users that reinforces active participation. ‘‘Conceptually, social discourse exposes people to a wide range of information that may influence participatory decisions, such as information about the desirability of participation. Discussions with friends who are interested or active in politics can help people learn about the reasons for participating while reinforcing the idea that such behavior is desirable among one’s peers.’’  (McClurg, Scott D., 2003, p. 6). We just have to always bear in mind that these tools are useless if not exploited carefully, as quality and not quantity should be the primary criterion for every social rally. No digital means of communication, no matter how up-to-date it is and the range of opportunities it offers, should substitute real, active participation, with a physical presence on socio-political affairs, deep consciousness and critical mind, free thinking and decision making, especially during voting periods. There’s always the other side of the coin, where regimes of all kinds, even the most oppressive ones, become highly literate on the usage of social media and gradually transform them to perfect means of citizens’ deception and manipulation. Alexander, J.C. and Jacobs, R.N. (1998), “Mass communication, ritual and civil society”, in Liebes, T. and Curran, J. (Eds), Media, Ritual and Identity, Routledge, London, pp. 23-41. Eurostat (2009), “Youth in Europe – a statistical portrait”, 2009 edn, Eurostat Statistical Books available at: http://epp.eurostat.ec.europa.eu/cache/ITY_OFFPUB/KS-78-09-920/EN/KS-78-09-920-EN.PDF (accessed 15 October 2013). Thompson, J.B. (1995), The Media and Modernity: A Social Theory of the Media, Polity Press,Cambridge, p. 186. This vividly explains why the authoritarian governments desperately try to limit their effects by barring the access to the internet via mobiles or personal computers. (see i.e. Arab Spring).